Opening the doors for Innovation, Collaboration and Celebration of our heritage. Join us for the 4th Talk in our Trust Talks series as we explore the heritage of our unseen places. We often say that accessible heritage is loved heritage, but what about the wealth of heritage places that are generally unseen by the public? What is the value of these places to the community, how are they managed and more importantly…what do they look like inside? Dr Andrew Sneddon – Activating our hidden heritage. It is often said of heritage places that ‘you got to use it or lose it’ but that is rarely a simple matter. Andrew will consider the challenges associated with ‘activating’ our hidden gems and hard-to-get-to heritage places. Dr Andrew Sneddon is Associate Director of Extent Heritage and Manager of its Brisbane office. His knowledge of heritage practice includes both Indigenous and non-Indigenous heritage, which has seen him work on native title matters before the Federal Court of Australia, and in Aboriginal place management, built heritage management, and international archaeology. Andrew also has specialist knowledge in the field of heritage law. Jane Alexander – Inside the Official Establishments: The Hidden Heritage of the Prime Ministers’ Residences. Jane Alexander is the Heritage Advocacy Advisor at the National Trust of Australia (Queensland). Jane has worked as a built heritage specialist and archaeologist in Australia for 15 years. She was the former Chair of the National Trust Industrial Heritage Committee, a previous member of the ICOMOS Australia Executive Committee and her company Ainsworth Heritage won numerous industry awards and commendations. Ticket price includes drinks and canapes on arrival, a gift bag and an optional tour of the building at the conclusion of the talks. Parking is available at the Wintergarden and Queens Plaza carparks for a special rate of $12. Tattersalls Club is opening their doors to The Trust for our July talk. 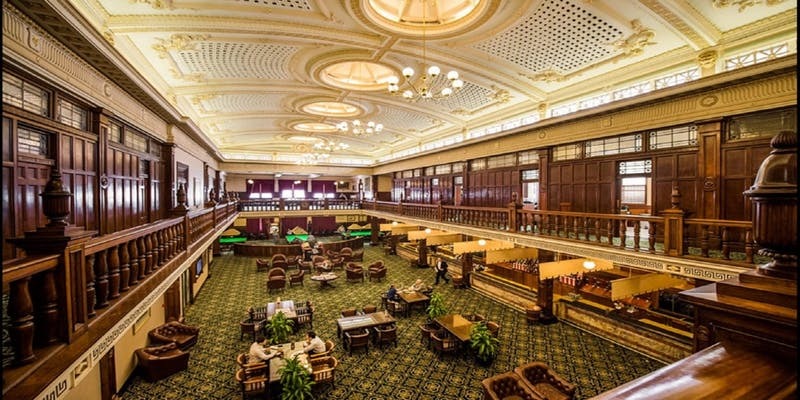 Usually only open to members of the club and their guests, this is a unique opportunity to explore the Club and see beyond the façade of this magnificent building. No denim, sports shoes, t-shirts or casual day wear.